I love when a crafty mishap turns into something kinda cool. 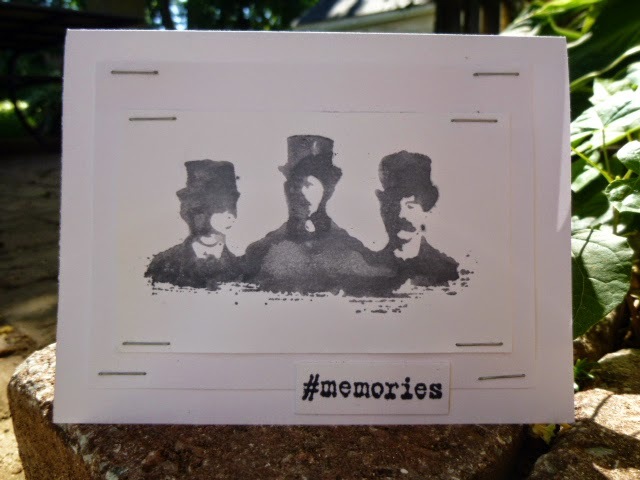 I was using the "three men in tophats" stamp on another project...when I was done I realized that I didn't have any baby wipes to clean the stamp. Hmmmmmm I thought to myself...being too lazy to walk across the hall to the bathroom to wash the stamp, I just spritzed it with water and stamped it off on a scrap piece of white paper. Hmmmmm I thought to myself again, I kinda like how that looks...I'm going to leave it until it dries to see if I am going to use it or recycle it...you guessed it, I used it! I love how all the detail in the stamp fades as you move to the left of the image...like an old photograph that was damaged by water. I wanted to keep it pretty CAS but I added the staples to break up the white on white on white. hmm my happy accidents don't work out that awesome. I'm sorry I've missed commenting but it takes longer with a magnifying glass lol. I need to find out if I can make the curser darker I lose it on the screen lol. Wow, this cleaning shortcut turned into such an awesome image, and a great card!